This is a short verse, amongst the shortest handful of verses in the New Testament bible. The story of Lot’s wife was originally told in Genesis 19 – But Lot’s wife looked back, and she became a pillar of salt [Genesis 19:26|Article]. There was a specific instruction for them to not turn back – As soon as they had brought them out, one of them said, “Flee for your lives! Don’t look back, and don’t stop anywhere in the plain! Flee to the mountains or you will be swept away!” [Genesis 19:17], but she did. In Luke 17, about 2000 years later from the incident, Jesus reminded the disciples about the day that incident happened as he was teaching them about the day that the Son of Man is revealed. The topic arose because the Pharisees had asked him when the kingdom of God will come, and Jesus went on to elaborate about the day, drawing analogies from the history of their forefathers that the Jews were familiar with – first Noah, then Lot. In this study, we will examine the incident where Lot’s wife turned into a pillar of salt and see what we can learn from that incident. Remember – It is unlikely that the disciples do not know about this story. Lot was afterall, a close relative of Abraham and also the father of Moab and Ben-Ammi, whom the Moabites and Ammonites, historically neighbours and usually enemies of Israel, descended from. However, it was a story so incredible that one would mostly place the attention on the sins of Sodom and Gomorrah and how the wrath of God was manifested in all its glory. Not much attention was given to Lot’s wife – indeed, all that happened to her was briefly described in a single verse. Jesus wanted his disciples to pay special attention to what happened to Lot’s wife, and why, explaining – On that day no one who is on the housetop, with possessions inside, should go down to get them. Likewise, no one in the field should go back for anything [Luke 17:30-31]. Don’t be attached to the sinful things of this world, for if your attachment causes you to turn back to them, the path you’re heading down on is the path of Lot’s wife – doom. Indeed, Whoever tries to keep their life will lose it, and whoever loses their life will preserve it [Luke 17:33]. Lot’s wife – she is an intriguing character to me, despite the little air time given. Her name was not even deemed worthy enough to be recorded in the Bible, though to be fair, neither of Lot’s daughters had their names recorded too. Yet despite how little we know about her, what happened to her was truly extraordinary. She turned back, despite what the angel warned, and turned into a pillar of salt. Let’s ignore the significance of her turning into a pillar of salt for now. Let’s focus on her turning back. We don’t know why she looked back, yet we can probably speculate intelligently on that. It was said that she was a native of Sodom, as were the husbands of Lot‘s daughters, who were so used to the sins of the city that they were unmoved by Lot‘s warning [Gen 19:14]. They were destroyed along with the city. Turning back is a very human thing to do. You have done it before. I have done it before – whether physically, emotionally, or spiritually. Imagine walking through the customs at the airport, with you leaving your little toddler behind crying and screaming for daddy. Will you turn back and cast a sad glance at your child? You will – if you don’t, you’re pretty steel-hearted. Sometimes we don’t turn back physically, but emotionally. An ex-lover who suddenly appears? A relapse into an addiction that you thought you were freed from? Yet other times, it is spiritual – we often do that, don’t we? We go back to God, and after awhile, we turn back to our old ways, our old lives. Hardships come, and we realise our only hope is in the Lord, and we go back to him, and the vicious cycle goes on and on, much like the Israelites throughout their history. 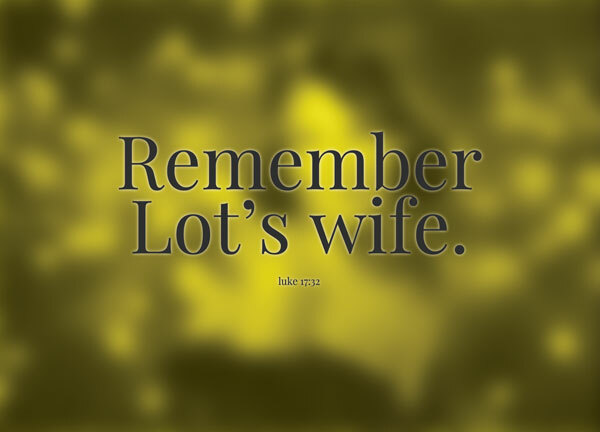 Remember Lot’s wife! Some versions render it with an exclamation mark, some versions do not. Remember Lot’s wife. They are both warnings, urgent and stern warnings. Don’t let your attachment to the old, sinful world become an obstacle in your relationship with God. Don’t look back – don’t miss it, don’t yearn for it, don’t think about the things that you have left behind. If your building is burning, just escape. Don’t look back and risk your life. Don’t think about the gold in your safe. Don’t think about the teddy bear on your bed. Just escape and don’t look back. On that day no one who is on the housetop, with possessions inside, should go down to get them. Likewise, no one in the field should go back for anything [Luke 17:30-31]. Don’t go back for anything. You shouldn’t go down to get your possessions. In the context of Luke 17, Jesus was speaking about the coming of the Kingdom of God. There is no room for attachment to the world when the time comes.